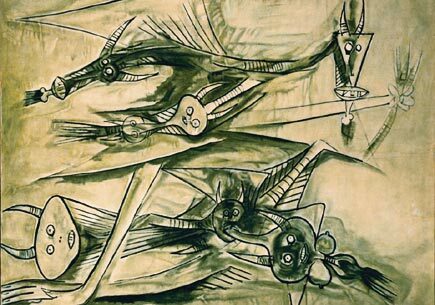 Wilfredo Lam (1902-19982) was an influential modernist Cuban painter. 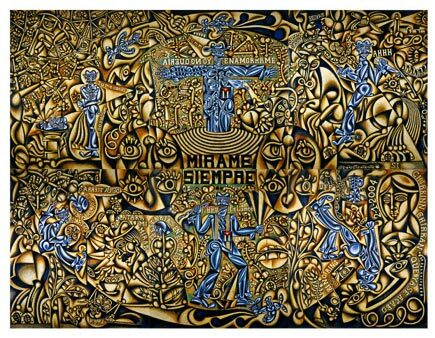 Among those who acknowledge his influence is the contemporary painter Carlos Luna. While Luna was born in Cuba, his work “deals in part with the duality of Cuban and Mexican heritage,” according to the Museum of Latin American Art (MoLAA) in Long Beach, where a show of the artists’ work is being presented through the end of August. Luna’s work, like Lam’s, is rich in historical and cultural symbolism. Above: Wifredo Lam, Untitled, ca. 1947, oil on canvas 49 x 59 ¼ in. Below: Carlos Luna, El Gran Mambo, 2006, oil on canvas, 144 x 192 in.